An easy-to-mount, heavy-duty guitar hanger featuring protective barrier sleeves for delicate finishes.. The Off the Wall Heavy Duty Guitar Hanger has a deep cradle which can safely and securely "cradle your babies" like no other guitar wall mount. This heavy-duty premium instrument hanger can hold up to 200 pounds thanks to its safe, 3-point mounting plate. Featuring protective barrier sleeves for delicate finishes, the hanger swivels to fit any instrument headstock shape for acoustic or electric guitar, 4 and 5 string bass, mandolin and ukulele (Note: It should not be used with classical guitar). Telecaster owners will love how well these hangers work with small headstocks. 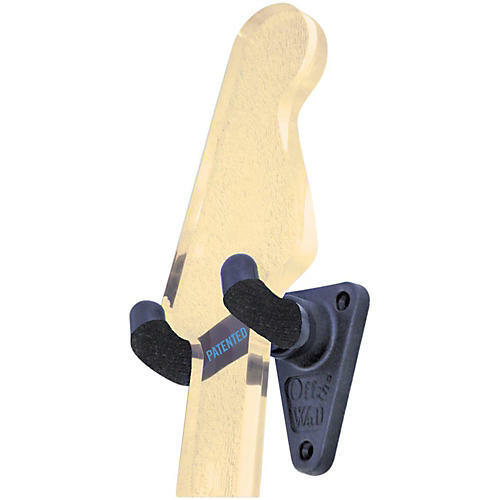 The Off the Wall Heavy Duty Guitar Hanger fits instrument necks up to 1-7/8" wide. Easy-to-use mounting hardware is also included.